privately held consumer finance companies in the U.S.
Cash Store is a trustworthy and reputable financial products and services provider and a direct lender. The company offers a variety of loan options including Cash Advance, Installment Loans, and Title Loans. Cash Store has been in business since 1996; the company has grown rapidly and currently operates over 340 store locations in 7 states. Cash Store has more than 20 years of experience in helping customers with emergency cash loans for unexpected expenses, delivering excellent customer service, providing competitive rates and terms, quick approvals, and same day funding. Cash Store has over 340 store locations in the following states:- Idaho, Illinois, Michigan, New Mexico, Texas, Utah, and Wisconsin. Cash Store is committed to the people they serve, and provides the best customer service possible, with the help of their professional and skilled team and over two decades of experience in the financial market. Their fully trained, knowledgeable, and qualified staff will work with you to locate which loan service works best for you and will make the entire loan application and approval process as simple as possible. Furthermore, with their secure, stress-free, quick cash services, you can have the cash you require in your hand within minutes, not hours! 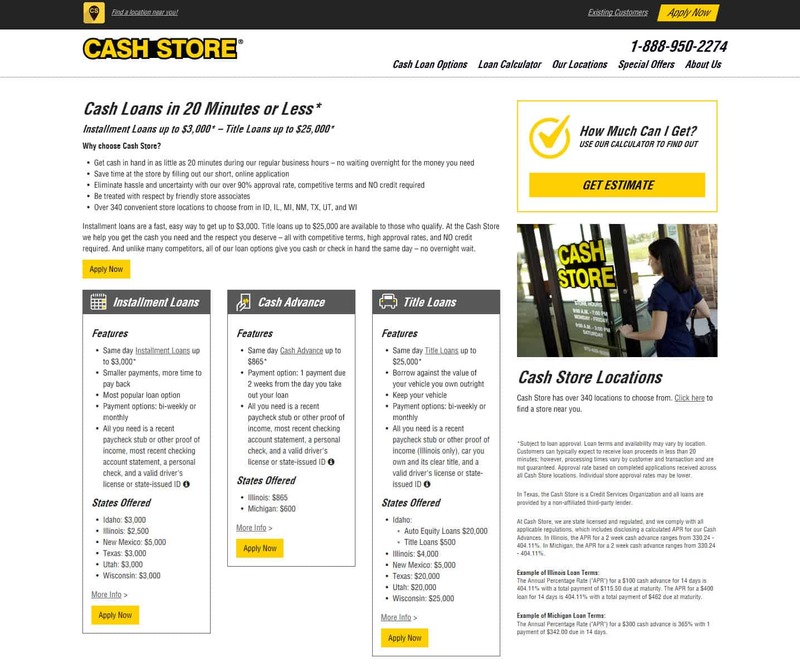 Products and Services offered by Cash Store. Cash advances also referred to as payday loans, are designed to support people overcome short-term cash needs when unforeseen expenses occur and to create a small breathing space in your budget until the next payday. A cash advance loan allows you a fast way to get cash when you need it, even with imperfect credit. The repayment term of the loan may vary depending on the state of residence. At Cash Store, you can also pay off your loan before the due date – whichever is most comfortable for you! 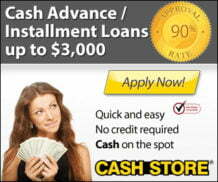 Cash Store currently provides cash advance in Illinois (up to $865*) and Michigan (up to $600*). Cash Store is a state licensed lender and complies with all applicable state laws and regulations. Installment loans can help you to bridge the gap in times of financial hardship – emergencies, car or home repair or in covering any unexpected bills. Also, there is no need to be concerned about immediately paying your installment loan back in one single lump sum. Installment loans can provide you with the flexibility to repay the borrowed funds back in multiple payments, which means you can comfortably schedule your due dates according to your pay date frequency (biweekly/monthly). Cash Store currently provides installment loan in Illinois (up to $2,500*); Idaho, Texas, Utah, & Wisconsin (up to $3,000*); and New Mexico (up to $5,000*). If you are in need of quick funds, when stressed over unexpected bills, a family emergency or due to an urgent maintenance expense, but you do not have any other alternatives left to borrow funds then a title loan might be the better choice. In order to obtain an auto title loan, you will have to pledge the vehicle you own as collateral, by providing the title of your vehicle to the lender till the borrowed funds are entirely paid back. At Cash Store, you can get up to $25,000* depending on the valuation of your vehicle. You just need a car having a free-and-clear title. Additionally, you can get yourself a title loan from Cash Store even if you have less than perfect credit or no credit. Furthermore, an additional benefit which you’ll find attractive is you get to keep using your car for the duration of the loan! Plus the repayment schedule for your loan will be a series of convenient payments, giving you ample time to repay. Cash Store currently provides title loan in Idaho (up to $500*); Illinois (up to $4,000*); New Mexico (up to $5,000*); Texas & Utah (up to $20,000*); and Wisconsin (up to $25,000*). Auto Equity Loans are also available in Idaho (up to $20,000*). Notice:- Vehicle is subject to evaluation for title loans and auto equity loans. How to Get a Loan from Cash Store? Cash Store’s aim is to provide their customers with a platform that simplifies the borrowing process and also makes it quick and convenient. The company also believes in removing the complexity that people often encounter while trying to borrow money. The online application form is created using the latest technology, which ensures complete privacy and security of your personal information. The application is built looking at the comfort of borrowers, on submitting the online application your information is sent to the nearest local stores ahead of your visit. Also, you fill out one form for all available loan products, which allows you to save time when you visit the store to complete the approval process and to discuss the final loan amount. A recent pay stub or any other proof of income. Valid driver’s license or state-issued ID. Bring the vehicle you own along with the free and clear title. Illinois residents should carry recent pay stub or other proof of income. The store staff will verify the documents and on completing the approval process, once approved you can walk out with your cash the same day. It’s that easy. In Texas, the Cash Store is a Credit Services Organization and Credit Access Business. Loans are provided by a non-affiliated third-party lender. *Subject to loan approval. Loan terms and availability may vary by location. Customers can typically expect to receive loan proceeds in less than 20 minutes; however, processing times vary by customer and transaction and are not guaranteed. *Approval rate based on complete applications received. Safety 256-Bit SSL Verified by Symantec Corporation. State Licensed Yes, Cash Store is state licensed and regulated and complies with all applicable regulations. Loan Amount Cash Advances up to $865*. Installment Loans up to $3,000*. Title Loans up to $25,000*. APR APR varies by state, loan type, loan amount, and loan terms. Loan Period Loan Period varies by state, loan type, and loan terms. Funding Time Customers can typically expect to receive loan proceeds in less than 20 minutes; however, processing times vary by customer and transaction and are not guaranteed.